Catherine of Aragon – she rules! You might have seen some blog posts and news stories about the lack of women on UK banknotes. This is normally an honour given to people of merit. So are there really so few women of merit in UK history who deserve to be remembered? When we were at Cybher everyone was challenged to write a blog post arguing for a woman to be on a banknote. El likes to read a lot of historical fiction and there was a series written from the perspective of servants to all of Henry VIII’s wives. 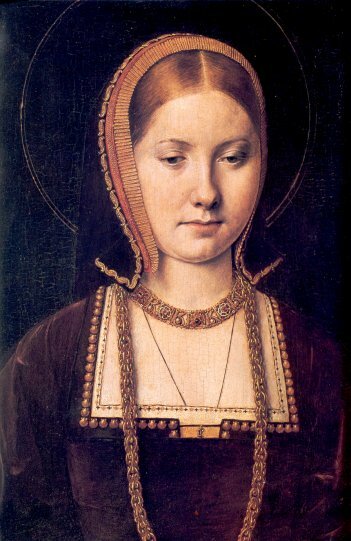 The first two books focus on Catherine Of Aragon’s struggle to marry Henry after her first husband (his older brother, Arthur) died and she was left in England, a widow. She could have gone home to Spain but she was determined to marry Prince Henry and become Queen Of England. She had many difficulties on the way. There were dowry problems. Should the rest of it be paid now that Arthur was dead? Henry VII wanted to marry Catherine himself after the death of his wife despite the massive age difference. There were ambassador problems which left Catherine to become Spanish ambassador. She was the first female ambassador in European history. Finally King Henry VII died and whilst he lay dying he and his son Henry discussed important state matters and one of the things they decided on was that Henry should marry Catherine. After years of poverty, pawning her gold plate and worrying about money she was finally going to marry the man she had dreamed of. I could go on and on and on about her role as Henry’s wife, her struggle to give him children, how she ran the country when he was away at war, how she lost a child fighting a war for him, how she learnt to accept his mistresses and how his love for her faded and how he began to hate her and changed an entire country’s religion just to get rid of her. He told her that not only was she no longer Queen but she had never been Queen. Many important men discussed whether she and Arthur had you know… done it. Her husband, the man she loved so much was leaving her for a manipulative woman who would happily see her dead. Even that quick over view was quite long. Sorry. But just don’t get me started because I could be here forever. It’s why this blog post has been taking so long! (Sorry…) But instead I’ll skip to here end. She was left alone with just a very loyal servant, growing ever more ill, away from her husband and her only daughter. She was hated by the man she loved most and she was utterly abandoned after a life devoted to him as the Queen of England she was now just Dowager Princess. After someone asked Henry if she could move to a more comfortable castle he merely sent her to an even damper, colder castle. She eventually died aged just 50. And what really makes me sad is that most people don’t know what she went through. All that kids at school learn about her is that she was the 1st wife of Henry VIII, she was divorced, that she gave birth to Mary I and that she couldn’t give Henry a son. That’s true but there’s so much more to her than that. So, should we have more respect for Catherine of Aragon and give her a space on a banknote? You can also join the #Banknotes campaign by signing the petition. There’s a post to link up to on Nixdminx blog and a #Banknotes Pinterest board where all campaign faces will be featured. You can also tweet your suggestions using the #Banknotes hashtag. July 18, 2013. Tags: catherine of aragon. Random wisdoms, Rants.